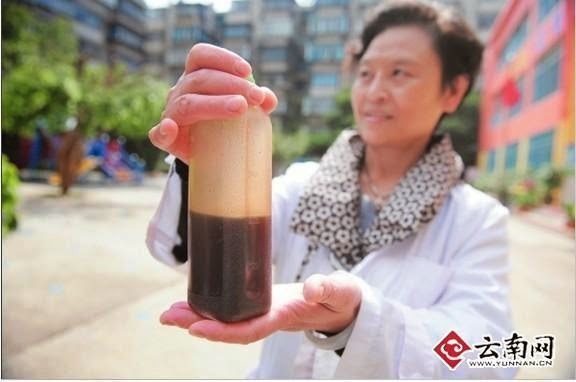 Health authorities in Kunming have ordered a school to stop forcing kids to have daily "antiseptic" vinegar throat washes to prevent infections. The order follows a series of revelations of kindergartens giving children unauthorised and often dangerous drugs to prevent infections. Pregnant women in coastal areas of China have been advised to avoid seafood because of high mercury levels, which have been linked child developmental problems. A new 60mcg hepatitis B vaccine is effective in the 10% of Chinese people who do not respond to the standard hepatitis B vaccine, a viologist says. Chinese villagers have high rates of COPD because of cooking with coal in unventilated kitchens, a study from Guangdong has found. However, switching to biofuels and increasing ventilation can substantially cut rates of lung disease, the research showed. Children in China suffer physical abuse from harsh parental discipline, a study has shown. Researchers from Shandong Normal University surveyed 2518 families and found that 15% of Chinese children experienced severe physical abuse such as being kicked, beaten with a stick, fist or belt or being knocked down by a parent. The study found that 80% of Chinese parents used verbal aggression to punish their children and 50% used corporal punishment. Malaria is still a risk in Yunnan border areas with Burma especially between April and July, with new figures showing there are more than 10,000 cases reported. The deaths of four hospital patients given intravenous drips this month are being investigated by authorities in Jiangsu. Yizheng People’s Hospital said three of the four patients had been given the same medicine, which wasn’t identified, but from different batches. The medicine had been withdrawn from use across the city and its producers are being investigated, yesterday’s Modern Express newspaper reported.